Rafe Danvers believes that he is finally about to reach his goal in owning Greyson Park, a crumbling estate that nonetheless holds the secret to restoring his family’s stature in the eyes of society. The house was originally supposed to be part of his bride’s dowry, but his fickle fiancee left him standing at the altar. So, no bride, no estate, no restored family honor. He has no love for the Sinclair family, but he can’t pass up the opportunity to buy the manor when his almost mother-in-law offers to sell it to him. As he goes to inspect it, he finds it inhabited by a girl who claims that she is the owner. Hedley Sinclair finally has something to call her own. She’s not sure why her grandfather chose to leave Greyson Park to her, but she’s ecstatic to leave her cruel family and live on her own. Ever since she suffered a tragic accident as a child, her mother’s attitude toward her drastically changed. She was locked away in the attic, kept from company, and scorned by her mother and sister. (This sister being the one who jilted Rafe Danvers.) Over the years Hedley has come to think of herself as invisible. Hedley can’t believe that the man at her door claiming to own the house is the man she admired from afar, the one who was going to marry her sister. It soon becomes clear that Hedley’s mother cheated Rafe, as she had no authority to sell the house. While Rafe is enraged at being humiliated once again by the Sinclair family, he can see that Hedley is cut from a different cloth. He decides to check into what can legally be done. He finds that if Hedley marries, she forfeits the estate, and therefore his purchase would be legal. So Rafe intends to marry Hedley off. Coincidentally enough, he has a wager going with his two chums about which of them will marry first. Lord Everhart has already married, and if he can only entice his other friend, Lord Montwood, to marry Hedley, he will win the wager AND obtain Greyson Park. My heart went out to Hedley. The treatment she received from her family was so unjust. Her mother and sister are some of the most despicable characters you’ll find. When she was a traumatized child, and needed their support, they treated her as if she were mad. Her strength of character showed when she received her inheritance. She learned to face her fears and stand up to her family. Despite his plan to marry Hedley off to Montwood, Rafe finds himself becoming enthralled with her. When she is in danger, Rafe realizes that he truly cares for her. I loved seeing Rafe and Hedley fall in love and find their happy ever after. It was a joy to see Hedley no longer want to be invisible. 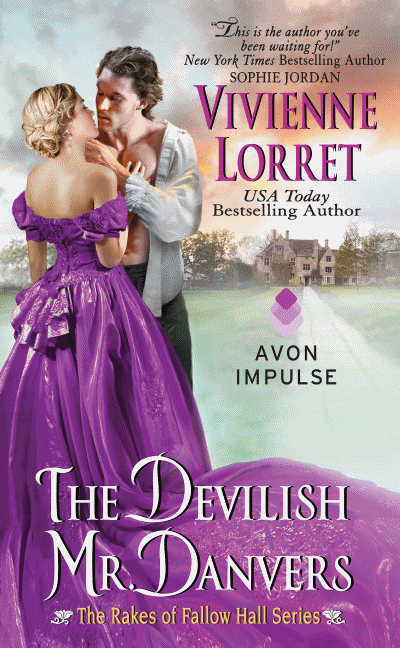 Vivienne Lorret has a lovely writing style which I enjoy very much, and the pages of this book just flew by. This was an engaging and touching read, and I heartily recommend it. Link to Rafflecopter Page, http://www.rafflecopter.com/rafl/share-code/NTIxYWM0YzhjYmFkNDc1MDkxYzA3ZDNmMjhhM2RjOjY0Ng==/? Thank you for hosting THE DEVILISH MR DANVERS! I enjoyed reading your review, Rose. It definitely makes me want to read this book. I’ve added to my “definitely must-read shelf” on Goodreads.